Most patients admit that they would just love to have a whiter smile. Have you ever wished for that, as well? If you love coffee, red wine, or simply have had several birthdays pass, then you might notice your smile’s brightness beginning to fade. Although smooth in appearance, our teeth are actually very porous, and those microscopic pores soak up stains over time from the food and drinks that we consume. We can help you to safely lighten the shade of your smile. We offer three different types of professional teeth whitening options for you to choose from. After taking impressions of your smile, we will create custom fitted trays that gently hug the surfaces of each one of your teeth. These snug trays keep our professional strength whitening gel right where you need it to be for optimum effect and for the protection of your gums. Dr. Sekhon recommends wearing the trays with the gel for about an hour a day, for around 10-14 days. Most people see results within the first several days. This whitening option gives you the freedom to whiten at your convenience and to the extent that you prefer. Don’t want to wait days to see whitening results? ZOOM! Teeth whitening takes about one hour to perform here in our office. With ZOOM! we are able to whiten your teeth by several shades in just over an hour. 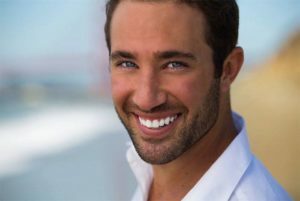 Fast teeth whitening is safe and ideal for people who are trying to look their best with less of a time commitment. You could end up with a stunning new smile just in time for an important event! Laser teeth whitening is an efficient alternative to other tooth whitening methods. It’s safe, effective and fast. Using whitening products that are accelerated by specialized laser wavelengths, we are able to amplify the stain release process. A whiter smile could motivate you to be more thorough and diligent in brushing and flossing. Teeth whitening is a great procedure to have done on its own, or in combination with cosmetic treatments like dental veneers, bonding and porcelain crowns. All treatment is provided by a general dentist. For more complex cases, we often refer our patients to a specialist for treatment. Ask Dr. Sekhon which type of whitening is best for your smile. Call our office today to schedule your smile evaluation.